Deer showing visible signs of chronic wasting disease. Photo: Terry Kreeger, Wyoming Game and Fish and Chronic Wasting Disease Alliance. The Maryland Department of Natural Resources (DNR) has been testing for CWD since 1999. Efforts were increased in 2002 with the discovery of the disease in Wisconsin. As of 2012, over 7,500 deer have been tested for the disease statewide. In recent years, efforts were focused in Allegany County near to where West Virginia discovered the disease in 2005. To date, DNR has detected the disease in one deer. The single positive sample was taken from a 1½ year old buck shot in Green Ridge State Forest during the 2010-11 firearm season, near the West Virginia outbreak; that is why the Maryland Invasive Species Council has named Chronic Wasting Disease as the October Invader of the Month. While there is still some speculation that CWD can infect humans, there is an increasingly convincing amount of data and research that shows there is no tendency for this disease to ‘jump’ the species barrier. There is hope that CWD is more like scrapie, which was first identified in the 18th century and has never been documented to infect humans. Nevertheless, CWD is a disease to be cautious of and it is appropriate for wildlife agencies across the nation to be vigilant and respond quickly to positive cases. Update: Distribution of chronic wasting disease in North America as of March 2017. USGS National Wildlife Health Center. CWD was formally identified in 1967 at Colorado State University. 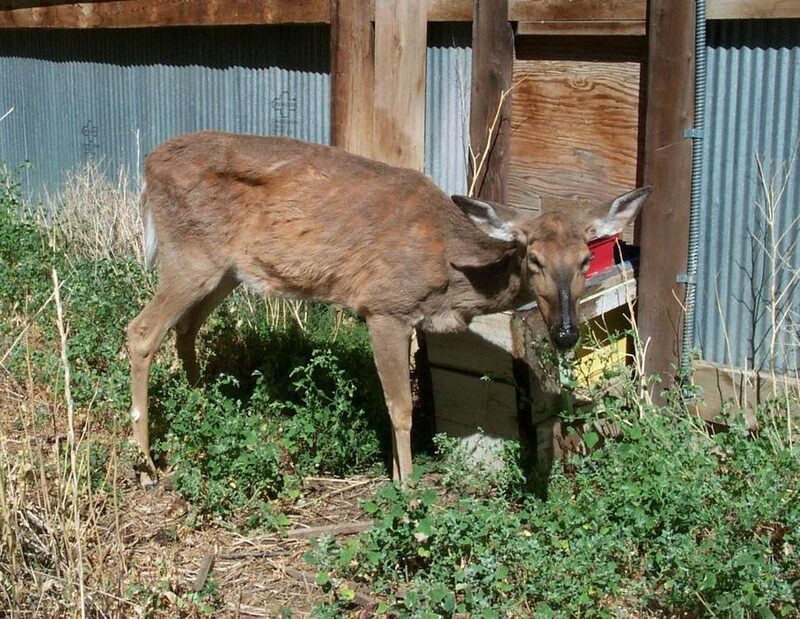 The disease was discovered in captive mule deer used for research purposes by the university. CWD remained a cervid (deer family) disease of the west until 2002, when it was discovered east of the Mississippi River in Wisconsin. After the Wisconsin discovery, CWD surveillance increased significantly across the country, due largely to federal funding made available by USDA. Since that time, the disease has been discovered in numerous other places, and is currently documented in 20 states, 2 Canadian provinces, and Korea. It is hypothesized that much of the spread of the disease can be attributed to the buying, selling, and transporting of deer and elk across the country, and overseas in the case of Korea. In some areas the disease is confined to captive cervids, whereas in other areas, like Maryland, it is found in free-ranging animals. TSE’s are unique in that they are not caused by bacteria or viruses, but instead by mutated proteins called prions. Prions cause normal proteins found in the neurological system to mutate when they come in contact and these mutations ultimately result in brain tissue damage and eventual death. Prions are extremely difficult to destroy and can persist in the environment for years. Chemical hydrolysis digestion is the most effective way to destroy prions. Research continues on modes of disease transmission, but results to date indicate CWD can be passed among deer via saliva, excrement, and previously infected soil in the environment. Managing for CWD is not easy. The disease most likely will not cause significant declines in deer populations in the east for the foreseeable future, but it will impact hunter behavior and could actually have the opposite effect on deer numbers. Some states with CWD have shown declines in hunter effort in CWD areas, resulting in decreased annual harvests, which are needed to maintain deer populations. Educating hunters and the public about CWD and maintaining public confidence regarding the disease is critical to effectively managing the disease. It should be noted that states with CWD that have attempted to eradicate the disease or slow its spread via deer density reductions have had little success. As a result, MD DNR has not employed sharp-shooting or liberalized seasons and bag limits in its CWD management efforts. Baiting and feeding deer was prohibited in the CWD management area, and transport of potentially infected carcass parts out of the area was restricted. Dumpsters were placed in the management area for carcass disposal, and select processors (butcher shops) and taxidermists in the area were identified and educated on proper carcass handling and disposal. MD DNR will continue to test for CWD annually, concentrating on the current management area. Unfortunately, given the growing infection zone in West Virginia, it is unlikely Maryland will be CWD-free in the near future. While DNR definitely does not want CWD to spread quickly throughout the state, neither does it see the need to significantly impact hunters on a large scale with additional regulations. The best approach at this time is to monitor the presence of the disease in the state, remain up-to-date on developments in CWD research and findings, and continue to educate the public on how to live with CWD. Additional, up-to-date information concerning CWD can be found at the CWD alliance website and the Maryland DNR website.